Pages 1 and 2 – are of the same indexes (groups #1 through #5). These charts consist of monthly, weekly and daily charts. The monthly charts have a wave count beginning with the bear market bottom of 1974 through the present. Each set of succeeding charts consists of shorter time frames. The sets range from a 33 year view to 1.5 years. Page 3 – are charts of my key indicators. Pages 4 and 5 – are charts of 10 different market indexes. Page 4 are daily charts and page 5 are weekly charts. There are some interesting charts on these pages. Each sector chart shows the following key indicators. Pages 6 through 7 – are various indicators. Don’t let all these indicators confuse you. They simply are an indication of the general health of the market. Watch for a divergence between the indicators and the price index. Some indicators consist of oscillators where you watch for extreme overbought or oversold conditions. Page 8 – is various indexes or exchanges showing the percentage of stocks above the 50 day and 200 day moving average lines. The more interesting indicators have an * in the title bar. My tweets are frequent and my blog updates are infrequent. Tweets are very short and may contain a link to a chart that will explain my point. I’ve noticed that sometimes a chart appears squished and unreadable. Just use the refresh button on your browser and it should be OK. If not, let me know. I have no idea what’s causing this occasional problem. Sentiment is usually a good indicator of showing when you are in the “area” of a market low or peak. But as I’ve said before, sentiment can go farther than anticipated even into all time extremes before a market correction takes place. That’s exactly what’s taking place presently as we keep going deeper into extremes of bullishness. The “crowd” is always wrong at market peaks and lows and the crowd is on the extreme side of bullishness presently. At some point they will be proven wrong . . . but when will that take place? 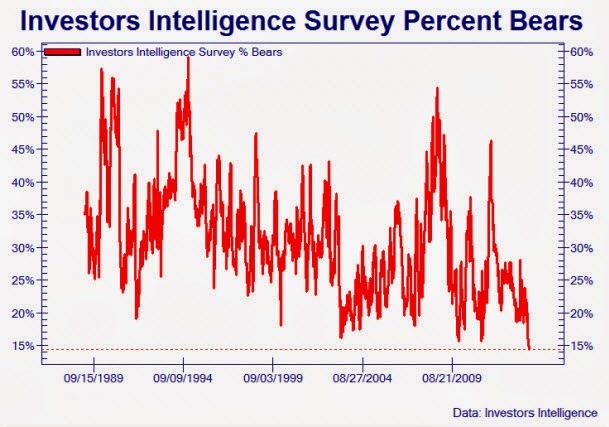 In the chart below you can see we are going into the area of an all time low on the percentage of bears in the Investors Intelligence survey. This chart begins in the late 1980s. 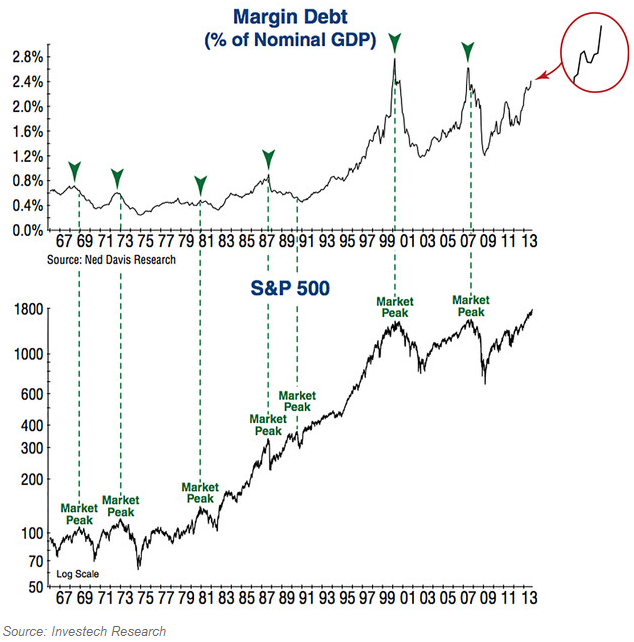 Below is a chart from Ned Davis Research that shows margin debt vs nominal GDP. It shows that as this ratio rises into the neighborhood of a new all-time high, market peaks have occurred in the past. This is an interesting chart and one that I hadn’t seen before. Ned Davis Research produces some interesting charts and it only costs about $40,000 per year for their minimum subscription. It’s for institutions only. Margin debt is money that is loaned to margin accounts to buy stock. As optimism rises, investors are more inclined to use margin to buy stocks. The following is from Yardeni Research, Inc. on market sentiment (PDF). I need to stress again that even though we may be at all time extremes in sentiment that doesn’t mean the stock market is going to promptly turn and correct. I’ve seen sentiment extremes go on for a long period of time before a correction took place. As for myself, I’m waiting for an obvious wave count or a break in the rising channels to call an end to this bull market. We’ve been in 3rd step up for a long time, but it just keeps going and going. The refusal of this market to correct is what is fueling the rising sentiment. Following are some charts showing the market bumping up against the top of most of its trendlines. Some of these charts have starting points in 2009. I will try to answer all questions. This entry was posted on December 21, 2013 at 11:43 AM and is filed under SENTIMENT. You can subscribe via RSS 2.0 feed to this post's comments. You can comment below, or link to this permanent URL from your own site. Take a look at the charts on page 9. Several new ones on this page. Hi Bob pertaining to your resent tweet which new chart are you referring to? Thanks for your time Bob, you helped me a lot. Thanks for the question, it produced a different result than I anticipated. The 2009 SPX chart took me a few minutes to figure out how that line originated as the channel limit lines???? The line used was a compromise trendline and not a simple line across bottoms or peaks. After trying the channel line on many different points on the chart, I found what I believe was the original line’s contact points. This was a compromise line that best illustrated the trend since 2009, I simply placed duplicates of the line on the low and high points on the chart. I created this channel more than a year ago. The high channel trendline has already been exceeded using the highest point for the lines placement. I then looked back to the preceding decline (2008) for the next point that I could use for the parallel line. That point was a peak in November 2008. SPX is in contact with that channel line presently. The original line for this chart is shown in red at the following link. The green arrows are the contact points that verified this line. Moving this line around, you can find other valid contact points. I then duplicated the line for the peaks and lows to form a channel. Sometimes it can be easy to find a channel line. It’s usually as simple as drawing a line across bottoms or peaks. At the time that I drew this channel (many many months ago) this was the best that I could come up with for a working channel. With further development, a line across the bottoms and duplicated for the peaks has produced a perfect channel. You never know when this method will produce a valid channel as sometimes prices will never contact the upper channel line. I find that there can be a difference between a working trendline and a line connecting peaks or bottoms. I expect my trendlines to produce valid contact points and not just a line that sits in space and never produces contact points. Your question made me go back and re-evaluate my 2009 SPX chart trendlines and I found a better chart today. That’s what questions will do, force you to take a second look and make sure the original premise is still valid. In this case, prices had risen so much that there was a better solution than my old trendline. Regardless of which chart you use, both charts show the SPX banging up against overhead resistance on the upper channel. By the way, any questions I ask are to educate me, no other reason. Just trying to learn the craft better. Specify a chart that you don’t understand and I’ll tell you what I did. But one thing I try to do is draw my trendlines looking at reference points prior to the trend’s beginning as a point to include as part of the trendline. This method only works part of the time. Clear as mud, probably, but I can tell you more clearly with a specific chart. Bob, do you have a specific way you draw your channels, it seems as if they are not touching price points at times.